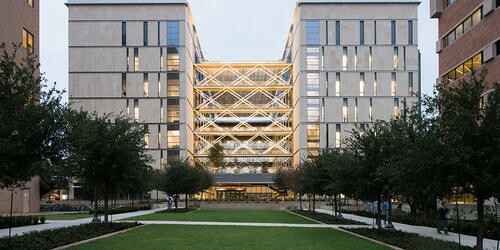 The University of Texas at Austin’s Cockrell School of Engineering, limited by outmoded facilities, sought to revitalize itself with a new building that would house an entirely new interdisciplinary approach to teaching and research. The result, the Engineering Education and Research Center (EERC), has been open for just a semester and has already had a transformative effect on the school. By fostering a sense of community and common purpose, in place of the previous loosely affiliation of departmental facilities, the EERC has completely transformed the Cockrell School as an entire institution. The EERC is a building for everyone. Beyond its core program of interdisciplinary research and teaching, it houses a host of programs intended to attract all engineering students, faculty, and staff. Previously non-existent spaces like a cafe, an innovation center, a media center, an advanced makerspace, an auditorium and conference center, a student organization center, and a suite of indoor study spaces and outdoor terraces all serve to bring the Cockrell School together in ways they have never before experienced. 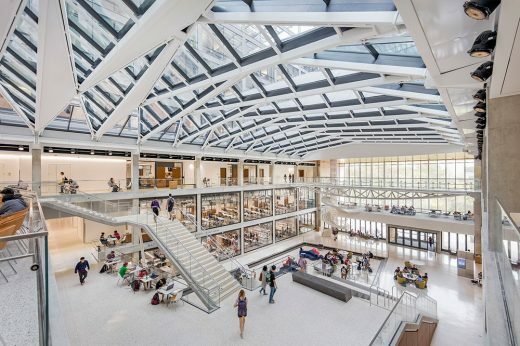 The beating heart of the project is a voluminous daylit atrium that connects two nine-story research and teaching towers. 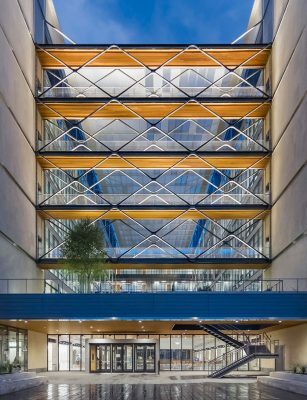 This atrium, called the Commons, is a vibrant three-story hub of activity and energy that offers a new and powerful center of gravity for the entire precinct. The Commons is packed full of collaboration, study, and learning spaces open to all occupants. 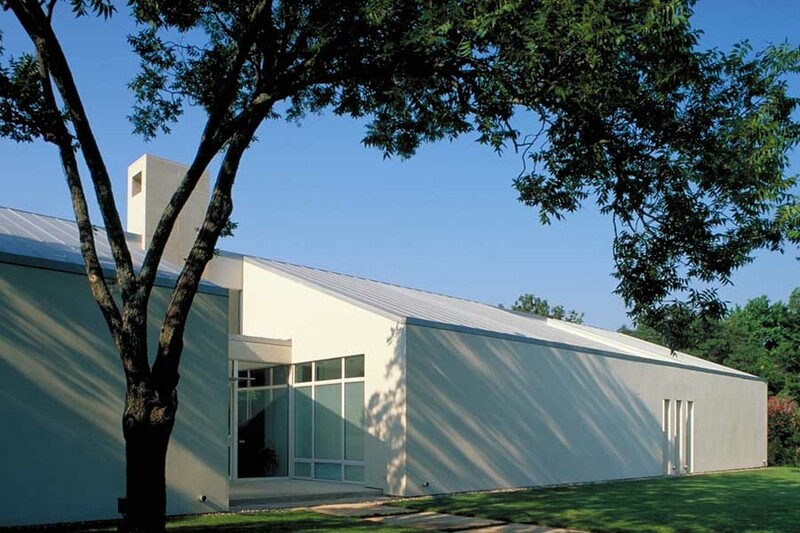 A folded glass and steel roof affords dramatic views of the research neighborhoods above and the Texas sky beyond, creating an important visual link between the innovative and ongoing research of the School. 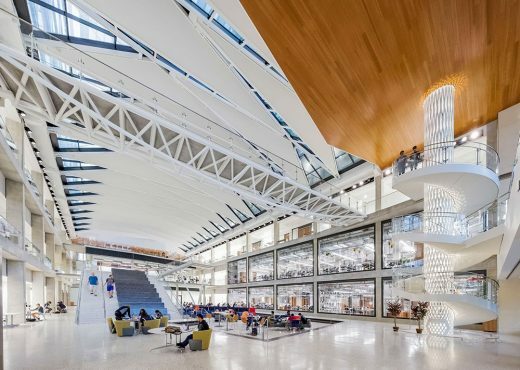 The perimeter of the Commons is lined with visible and exciting program, including a fully exposed, 23,000 square-foot Student Project Center that transforms transforming the way that the School teaches its undergraduates. 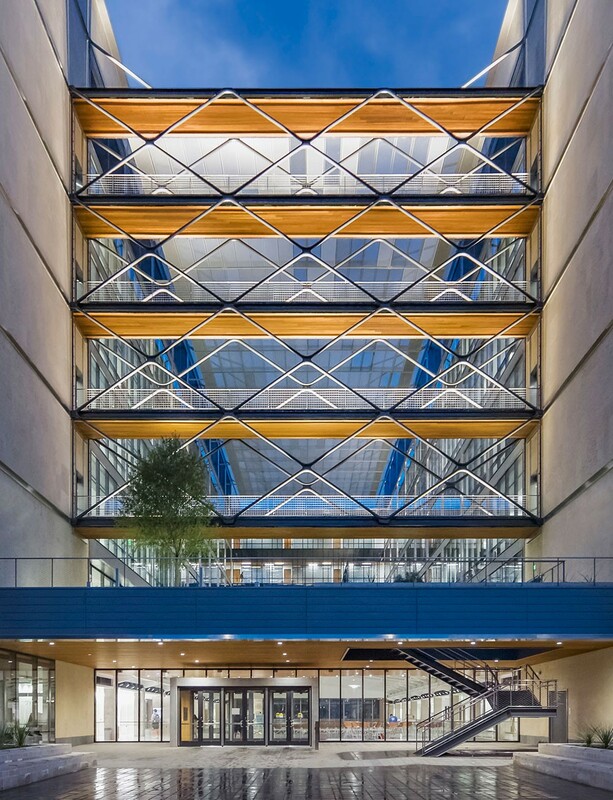 The EERC is also a state-of-the-art research facility, as evidenced by the five floors of highly flexible interdisciplinary and departmental research labs located in the upper portions of the two towers. These labs are supported by faculty offices and open work areas for graduate researchers and are linked by sunlit bridges loaded with break rooms and collaborative work space. Layers of transparency from space to space allow one to stand in the north tower’s Interdisciplinary labs and peer through the entire building into the Electrical and Computer Engineering labs in the south tower. These visual connections further establish the interconnectedness of a previously divided community. 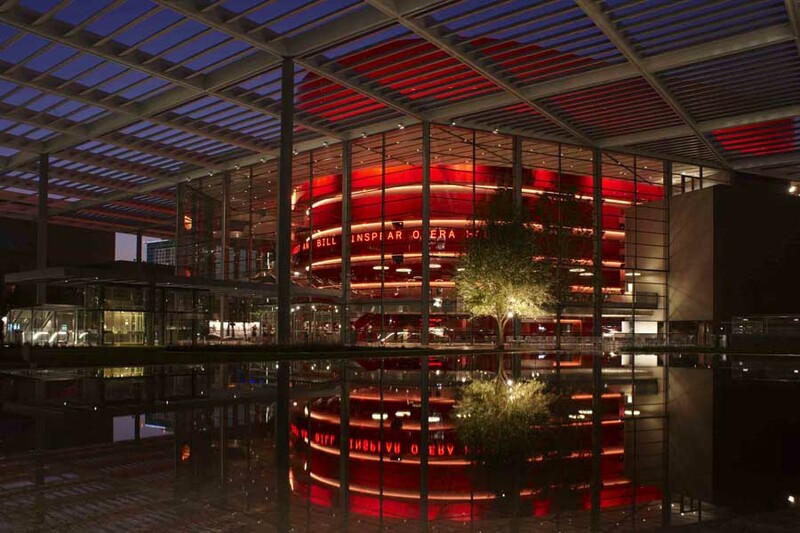 The EERC creates new important campus links and pathways, connecting a restored Waller Creek on the east to a new campus lawn on the west via an exciting two-story climb through the daylit (and air conditioned!) Commons. Spilling out in all directions are shaded and easily accessible outdoor spaces that animate the new mid-block building, humanizing its scale and giving back copious social and study space to the broader campus. More than just a lab building, the EERC is a vital interdisciplinary facility that re-energizes an entire precinct and underscores the important common purpose of its engineering community. 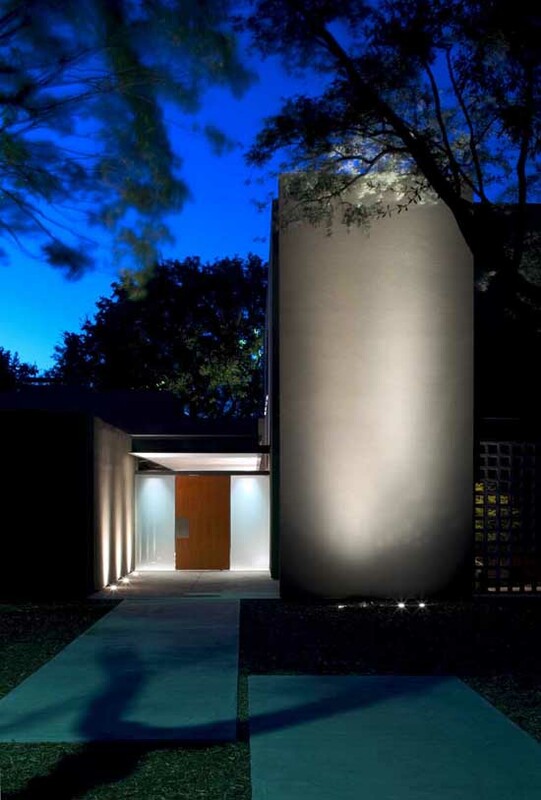 Associate Architects: Jacobs Engineering Group, Inc.